Every couple of months I make a large jar of detox bath that I have sitting on a shelf near my bathtub. I keep everything I need for a DIY detox bath right in the bathroom for convenience. I like to make a small jar or two extra to give as gifts. These are perfect for out-of-town visitors, teachers, neighbors, Mothers Day etc. I usually make little labels with instructions and tie a little ribbon around the top. I use this detox at least once a week. I find that it not only keeps my skin soft and my body less achy and relaxed, but I always feel full of energy and revived the next morning. I like taking these detox baths right before bed as they make me very sleepy and relaxed. Sometimes I add ginger, and usually add a little shot of apple cider vinegar and sometimes even rose petals off my rose bush in summer months. A few things I always keep stocked in my house: epsom salt, baking soda, apple cider vinegar, and empty glass jars. Every time I buy a jar of spaghetti or jam I check to see if the bottle is a fun one to keep. I soak the jars in hot soapy water over night and then peel off the rest of the label the next day. I then add that pretty jar to my ever-growing collection. I use glass jars for SO much! They hold and sort all of Liam’s craft and art supplies, they hold my cosmetics and I use them as decorations all over the house. Plus, every Christmas I give out a few neighbor gifts and having glass jars on hand for last-minute gifts is just brilliant. I’ll fill them with red and green M&Ms or a cookie mix, add a cute label and ribbon… and voila! This time I used a 14 oz old coconut oil jar and it fit perfectly to the top! I mix all the ingredients in a large bowl and then using a large funnel to pour it into the glass jar. I sometimes will spray paint the lid of the jar but this time I just tied a ribbon around the top with a little wooden scoop. Buying large bags of baking soda and epsom salts (I get mine from Costco) and apple cider vinegar are much more cost efficient and you will have less waste. 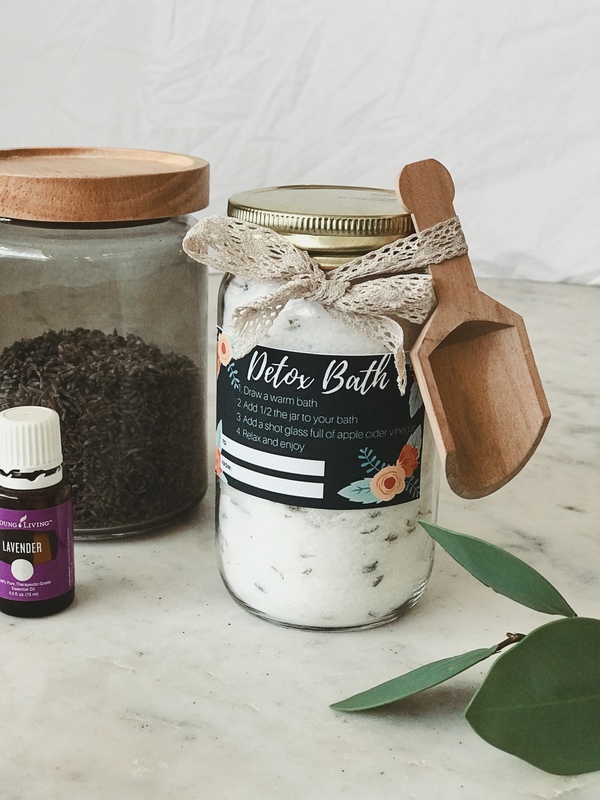 Buying in bulk is usually the way to go when making these types of DIY beauty and wellness items. You can also find large bags of epsom salts online at Amazon for a good price. The smell is divine (if you like lavender, of course) and it is such a simple and pretty gift! You can use double sided tape to adhere the label right on the jar. Tie a to the jar with a ribbon and you can skip wrapping it and give as a gift as-is. To print the gift tag click here. Do you take a weekly detox bath ? What are your favorite detox bath recipes? I would love to know in the comments ! I’ve used epsom salt in my bath’s for a long time, but this sounds amazing! I think I’d reap more benefits from adding more than just the salt to the tub after reading your article! Thanks for the info! I’m going to have to try this, it looks amazing and what beautiful pictures!! This is such a creative idea. I love that it is homemade and it would make a really lovely gift! I love enjoying a nice warm bath after a long stressful week. Have to try this out! That sounds so amazing!! I wish that we had a nice tub so I actually wanted to take baths. So excited – we have all of the ingredients. I have had a terrible pinch in my back this week and I think this is just what I need! Oh no ! I hope it works and you enjoy it !! I love this idea!! Your instructions were easy to follow and I love the idea of adding ginger or Apple Cider Vinegar to the bath. I’m going to try to make this for some mother’s day and birthday gifts. Pinning for future reference – Thanks so much for sharing! I love DIY home products with essential oils. I won’t have a bathtub anymore when we move in a few weeks so I need to get on this to use in my garden tub before the move! What a great gift idea as well as being something that you can really enjoy for yourself. It looks quite simple to put together so I feel confident this is something I could do quite well. I look forward to giving it a go! Thanks Nicole ! I hope you like it!! Seriously this post is perfect! I just made bath bombs and totally messed them up!! I decided that bath salts with be a much better idea, so your post is perfect! I saved it to my Pinterest. Going to try for sure! Also love the label and jar is so cute. This looks absolutely wonderful. I need a relaxing bath right now and I LOVE lavender.